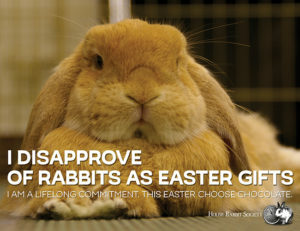 We are so excited to announce that, for the first time ever, parents looking to make impulse live Easter bunny purchases won’t find them for sale at pet stores in California and dozens of cities around the country. Check out this article featuring an interview with HRS Executive Director Anne Martin to find out why! A bill is making its way through the California Assembly, AB-44, which would ban animal fur in California. This bill, if passed, would be the first of its kind in the country, and would go far towards ending an incredibly cruel industry. This bill would make it unlawful to sell, offer for sale, display for sale, trade, give, donate, or otherwise distribute a fur product, as defined, in the state. The bill would also make it unlawful to manufacture a fur product in the state. 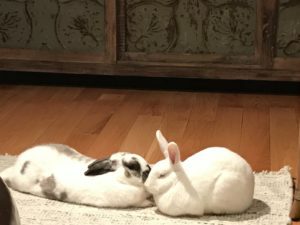 Agribusinesses are lobbying for an exemption for rabbit fur, claiming that they’re already killing the rabbits for meat, so they might as well sell the pelts. The problem with this is that rabbit meat isn’t very popular, so if rabbit fur becomes the ONLY kind of fur allowed in California, it’ll dramatically increase the number of rabbits who are killed. Instead of rabbits being raised for meat, it’ll be rabbits being raised for fur. In addition, the claim that rabbit fur is just a byproduct of rabbit meat is specious. Rabbits who are raised for meat are killed at a much younger age than rabbits who are raised and slaughtered for fur. 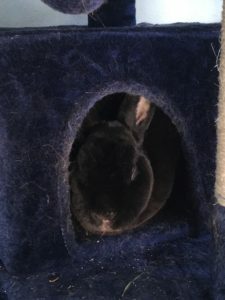 The fur from rabbits slaughtered for meat is just used for toys and trim; the fashion industry relies on rabbits raised and killed solely for their fur. 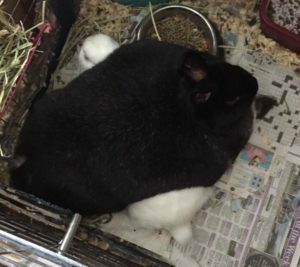 The meat from these fur rabbits is too “old” for human consumption. 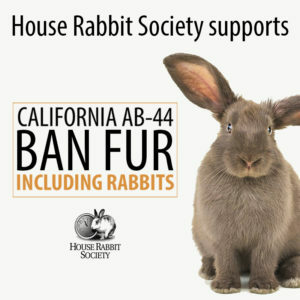 California residents, call your Assemblymember to let them know that you support banning fur, AB-44, including rabbit fur! Let them know you do not support any amendments which would exclude ANY animal. Find your Assembly representative here. Find out where the bill is right now in the legislative process. Read about the process of how a bill becomes a law in California. Please share with every California resident you know! Meet Skipper. 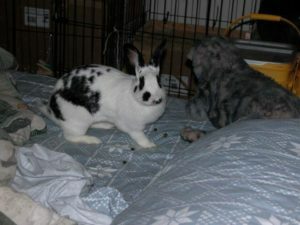 He was brought to me 7 years ago as an unneutered male that did not get along with others . People know I take in rabbits. It was a few years before he would pay much attention to me. I was good enough to keep his bowl clean and clean the litter box, but that was about it. My dog and cat accepted him immediately. 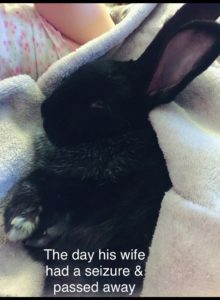 I have had at least one house rabbit continually since my first in 1985 I even brought my rabbit back from Germany in 1996 in a carrier under my business class seat! Skipper has no idea what a cage is and as I type this he is on my chest as I lay in bed. For about the last 3 months he has chosen to sleep on or under my bed! Sometimes he is even waiting for me a couple hours before bed time. 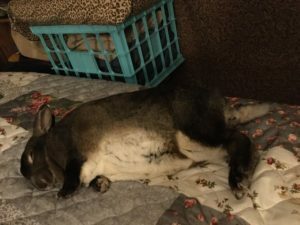 I don’t know how many rabbits live like this, but I think he is one lucky bunny. I get in bed, give him couple snacks and he hops to my right and flops himself on his side. Content. 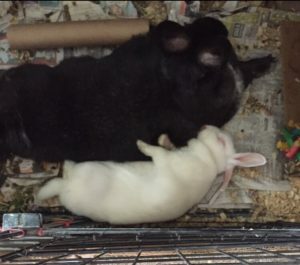 We adopted these bunnies (now Victoria on the left and Clara in the right) from you and we love them! The house is brighter with the two of them hopping around in it. This isn’t a perfect photo but to me it represents something beautiful. This is my Rex girl Powder sleeping in the cat tree. Last December I had to have my 18 year old cat put to sleep. 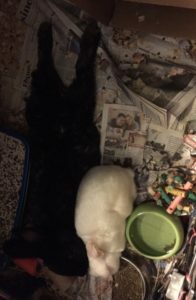 (While Powder was having dental surgery, so she didn’t get to say goodbye!) This picture was taken just about a week later. She had never gone up on the cat tree before. 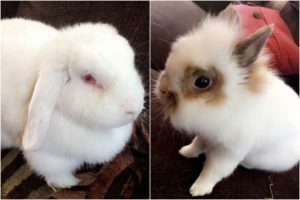 Meet our rescue rabbits, Marshmallow (8yrs old) and Sundae (7yrs old)! 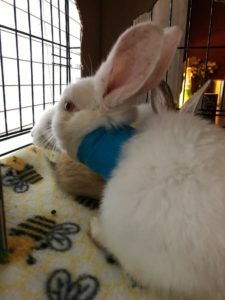 Our latest Emergency Rescue Grant has gone to The Bunny Burrow Rabbit Rescue, to help with the care of 21 rabbits pulled from a confiscation by the SPCA of Texas in Kaufman County, TX. To help, please visit this link!